When winter ends, spring startup begins — and profits are sure to follow. To keep your plant in top operating condition, it’s important not to rush or skip startup steps. 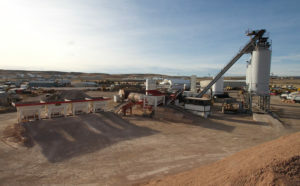 Here’s a quick guide to walk you through starting your asphalt plant back up in the spring in a way that will help ensure a profitable summer. To keep your plant in top operating condition, it’s important not to rush or skip spring startup steps. Think safety. It’s easy to get complacent after a long winter. Refresh yourself and your team on safety procedures before getting back to work. Check it out. Pull off the tarps covering the burner and burner blower, asphalt pump, water pump, exhaust fan and any other key items. Visually inspect the components as you go, looking for worn cables, broken water lines, damaged refractory tubes and loose or missing shields. Change the oils. If you didn’t change oil in all of the gearboxes when shutting down for winter, do that now. Pay attention to any signs of water or metal shavings, which indicate damage. Also replace the air compressor crankcase oil and any airline oils. Inspect. Work your way through the plant, checking for anything that’s worn, damaged, loose or missing after setting idle over the winter. Start with the drive belts, looking for frayed spots and cracks as well as checking the tension and alignment, ensuring it matches the owner’s manual. Then move to the sheaves, checking for cracks, chips or broken edges. Look over the conveyor belts to ensure there’s no stretching, cuts or excessive wear, and check that the drive pulleys’ lagging is intact. Keep it moving. When moving parts don’t do what they should, the whole operation will suffer. Test the venturi gates, watching that they close completely. Check the spray nozzles and, if they became clogged or broken over winter, clean or replace them. Run through all of the gates, as well, ensuring correct operation for the silo gates, cold feed bin gates, gob hopper gates and drag conveyor bypass gates. Test the limit switch paddles and then move on to the controls; make sure the indicators and switches all operate properly. Make it level. Check the alignment of the plant frame and, if necessary, level it to ensure the least amount of trunnion wear. Call a pro. Finally, have a qualified service technician come in to tune the burner.